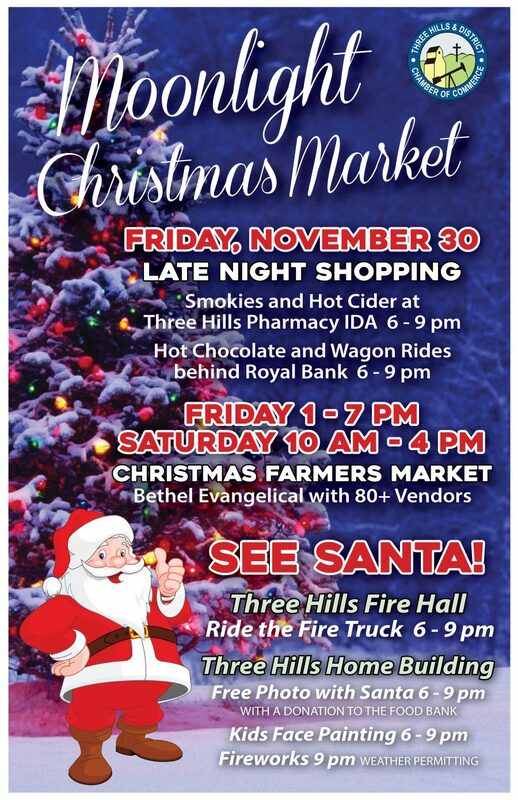 The Moonlight Christmas Market runs this year on Friday, November 30th, and Saturday, December 1st, just in time for Christmas shopping. Retailers in Three Hills stay open late Friday night to roll out their best prices for the throngs of people that stroll the packed downtown sidewalks. Many stores have hourly specials, free giveaways and draws for exciting gifts. Friday afternoon and evening, and through the day on Saturday, the Moonlight Christmas Market is on at Bethel Evangelical Church with over 80 vendors: home-based businesses, crafters and specialty retailers. This two-day shopping extravaganza is a highlight of the season and it comes wrapped in colourful and festive activities on Friday night: lighting Alberta’s tallest Christmas tree, Christmas lights on Main Street, rides with Santa on the Three Hills Fire Truck, horse-drawn rides, Christmas carollers, unique visiting vendors, fire pits for keeping warm, smokies and hot dogs and hot chocolate, and much more round out a delightful, entertaining event that’s fun for the whole family.